For anyone who has spent much time in church communities or even on so-called “Catholic Twitter,” the behaviors of the faithful that Pope Francis describes in “Gaudete et Exsultate” are not unfamiliar. What may not be so familiar, however, is Francis describing these tendencies with the serious language of heresy. Quoting “Evangelii Gaudium,”the new exhortation warns against “a narcissistic and authoritarian elitism” that shuts the door to God and a truly transformative reception of the Gospel (No. 35; see “Evangelii Gaudium,” No. 94). Most strikingly, he labels these behaviors as contemporary manifestations of the ancient heresies of Gnosticism and Pelagianism. Both of these heresies have been formally condemned for over 1,500 years, yet, Pope Francis argues, remain powerful obstacles to leading a holy life today, precisely because they present themselves as “false forms of holiness that can lead us astray” (No. 35). This is not the first time that Francis has drawn attention to the persistence of Gnosticism and Pelagianism. The pope’s first apostolic exhortation, “Evangelii Gaudium,” released in 2013,addresses this question (No. 94), and he has repeatedly referenced these themes in speeches. Perhaps as a result of concerns raised by some bishops or perhaps as a way to preempt debates surrounding this new document, the Congregation for the Doctrine of the Faith issued a rare letter to all the bishops, under the name “Placuit Deo,”this past February. The text, which was ordered and approved by Pope Francis, seeks to clarify doctrinal questions surrounding the pope’s discourse on Gnosticism, Pelagianism and salvation. Chapter Two of “Gaudete et Exsultate” develops and deepens these concerns in a more approachable style, as is typical of Francis’ writings. So what exactly is at stake here and why does Francis devote such a large chapter in “Gaudete et Exsultate”to the dangers posed by these ancient heresies? In many ways, Gnosticism and Pelagianism are two sides of the same coin. For contemporary forms of Gnosticism, the temptation is to reduce Christian holiness to a set of abstract ideas detached from the flesh. Such an approach makes individuals “incapable of touching Christ’s suffering flesh in others, locked up as they are in an encyclopedia of abstractions” (No. 37). As “Gaudete et Exsultate”rightfully points out, this is somewhat attractive in that a “strict and allegedly pure...[faith] can appear to possess a certain harmony or order that encompasses everything.” (No. 38). Ultimately, however, this approach fails to engage the messiness of real life, the suffering of people at the margins and the fact that God is a mystery that cannot be domesticated or understood easily. “God,” Pope Francis writes, infinitely transcends us; he is full of surprises” (No. 41). Perhaps more prevalent in the church than an arrogant Gnosticism are the many new forms of Pelagianism. Again, there is ultimately no room for God and God’s grace in a Pelagian framework. Salvation and holiness get reduced to our own powers, success and outward actions, which lead individuals to “feel superior to others because they observe certain rules or remain intransigently faithful to a particular Catholic style” (No. 49). The way “Gaudete et Exsultate” frames Pelagianism here is significant. As Francis points out, this heresy takes on different forms in “a variety of apparently unconnected ways of thinking and acting: an obsession with the law, an absorption with social and political advantages, a punctilious concern for the Church’s liturgy, doctrine and prestige, a vanity about the ability to manage practical matters, and an excessive concern with programmes of self-help and personal fulfillment” (No. 57). Note how this outlook would be both a temptation for those obsessed mostly with the church’s sacramental rubrics as well as those who may be consumed by the outcomes of a social justice program. Without allowing ourselves to be led by grace and the Spirit we easily shift our gaze from God into ourselves. What then is needed for holiness given these two dangers? In my view, the answer, as I have written about in my book Structures of Grace, is clear: We need a renewed theology of grace. We need a renewed theology of grace. With “Gaudete et Exsultate,” Pope Francis does just that as he helps to frame a theology of grace in several key points. First, in drawing our attention to the primacy of grace, the pope illuminates the dangers of both Pelagianism and Gnosticism by humbly reminding us that it is not about us; it is about God and God’s kingdom. As human creatures, by our very nature, we are limited. We cannot know everything nor can we do everything (No. 49). Second, a renewed theology of grace helps us to welcome God’s gift as “a source of contagious joy” in our lives (No. 55). If God is indeed at work in our lives, how, as Francis wonders, can we not live with a joyful gratitude? Finally, a renewed theology of grace draws our attention to the necessity of discernment, which itself demands a special gift from God (No. 166). It is ultimately this grace of discernment that will enable us to overcome the dangers of both Pelagianism and Gnosticism as we seek to live out the Gospel call to holiness in our own lives and in a messy world (No. 169). I have a question. Did Catholics believe all through the centuries what the Pope rejects ? Is, he criticizing what the Church taught for two thousand years. I get the feeling that what was conventional Catholic behavior and beliefs for hundreds if not two thousands years was wrong. Does this mean that all who went before the current Pope did not see it correctly or they were not inspired by the Holy Spirit as he is? I am not personally aware of any Catholics espousing anything close to Gnosticism and Plagiarism. Maybe some examples would be in order. Did Catholics do all through the centuries what the Pope rejects? The answer is yes and no. The pope is calling to people memories theologies that were help by some minority of Catholics in some past century and were condemned. For instance Palagism was condemned in the year 500 Ad by the bishops. He is pointing out that we need to always be on guard against the weaknesses in human nature that made those opinions popular in the first place. There has always been heresy's in the church, some that were help by as much as 1/3 of catholics before being eventully condemed and put to rest. Arianism is a good example, they were group who claimed Jesus wasn't God. There are at any given time active heresy's that have not been fully condemed or eleminated as well. Liberalism ( the idea the freedom is defined as the ability to decide for yourself what is right and wrong then do what you choose) and Americanism ( the idea that the american form of government and economic system is morally the best) are both condemned heresy's that are ascribed to by many in the catholic church today and are only slowly loosing ground. For many, the Inquisition conjures Gothic images of cloaked figures and barbarous torture chambers. So enmeshed is this view of the Inquisition in popular culture that such scenes play out even in comedies such as Mel Brooks' History of the World and Monty Python's Flying Circus. But is this a fair portrayal? And how was the Inquisition perceived in its own time? Professor Thomas F. Madden of Saint Louis University delivers a stimulating series of lectures exploring all facets of the Inquisition, including the religious and political climate of its time and the Inquisition's relationship to heresy and reformation. With a scholarly eye and infectious enthusiasm, widely published author and noted expert on pre-modern European history Thomas Madden imparts an understanding of the Spanish and Roman Inquisitions while dispelling popular myths associated with the subject. I listened to it about 10 years ago and found it extremely informative. I have to admit I had not heard of Liberalism and Americanism as heresies. In fact I have never encountered them in any discussion of Catholic theology except the term "liberalism" is common and can mean a lot of things. "...heresy takes on different forms.......ways of thinking and acting:....those who may be consumed by the outcomes of a social justice program." Wow! Doesn't this reference so very many of the articles available on this site? Pope Francis reads "America"!!! "For contemporary forms of Gnosticism, the temptation is to reduce Christian holiness to a set of abstract ideas detached from the flesh." What concrete examples is Pope Francis referring to by writing this? The statement itself means nothing without looking at particular examples that can tell us what he means by "abstract ideas detached from the flesh." Surely, he is not referring to Church dogma and doctrine which the Church has pronounced infallibly? To think we were wrong for 2000 years until Francis! Another puff piece about Francis's greatness. Is there not an independent thinker at America? America is a partisan political magazine. 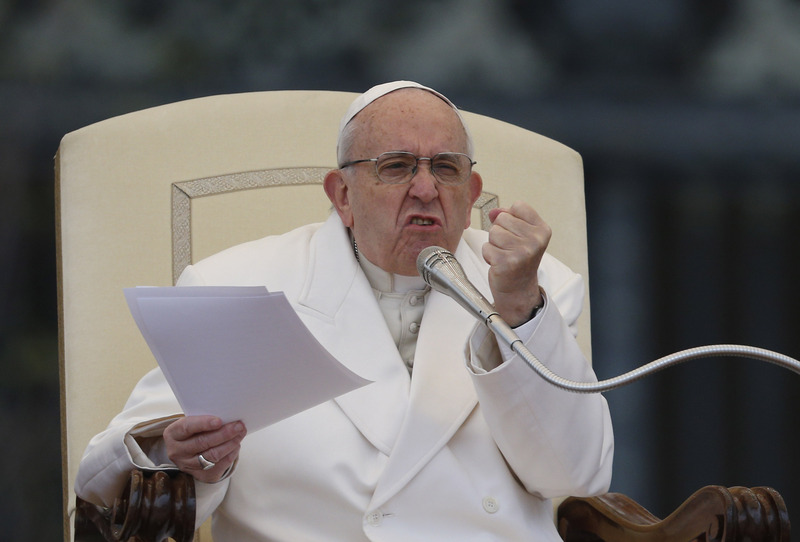 Pope Francis's politics are useful for America's ultra liberal politics. The number of articles on Francis vs Benedict is probably 10 to 1. Apparently the Jesuits changed dramatically in the late 1960's so those who had Jesuits from before then, experienced a very different type of thinker. There still are many Jesuits who think like the old Jesuits but few are given access to a platform like America.